Mattina on the hard: Every summer we take Mattina out of the water. This keeps her in good condition for the up coming winter. 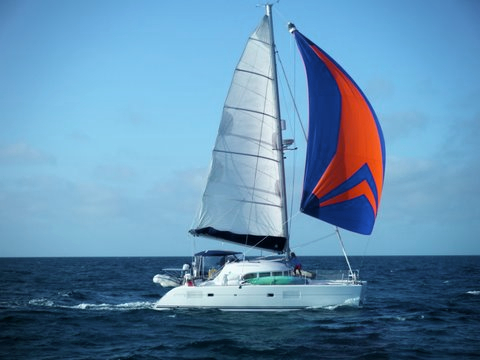 Mattina is a 2007 Lagoon 380 S2 Owner’s version catamaran. She’s equipped for extended live-aboard cruising. The question I get asked the most is why do I like her so much. There are so many reasons. 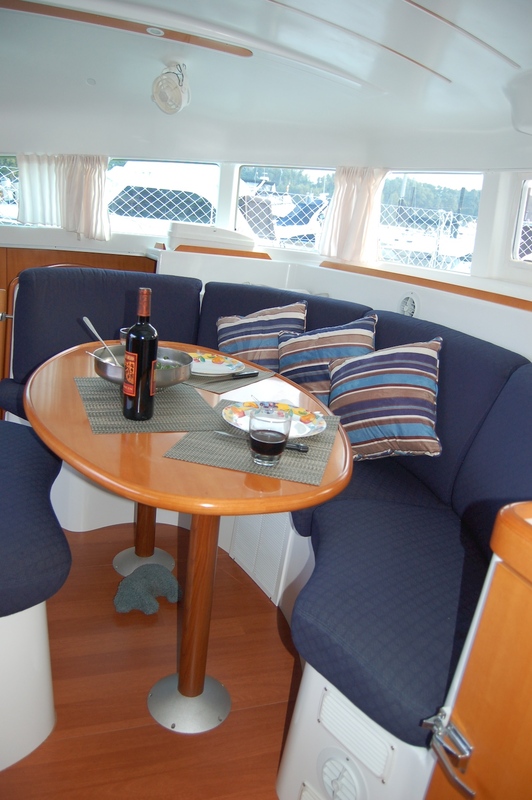 The light inside the boat and airflow make daily living pleasant. The windows are designed for visibility. We can see forward while we are in the cockpit without having to go out on the decks. She’s a quick sail, with easy to hoist sails. The cabins are spacious and comfortable. The cockpit is large and well suited for entertaining. The galley up configuration with window to the cockpit means we can socialize and cook at the same time. The steps aft leading to the water for swimming make me feel as if I’m living in a brochure. The shower is so large that I never use public facilities at a marina. Much nicer to shower in the privacy of my boat. She’s a solid boat that I feel safe on while at sea. Okay, I also love my water maker, hot water heater, genset, solar panels, air conditioner and SSB . These all add to the luxury of living on board. Mattina is built to host the systems required for comfortable long term cruising. Sailing with friends in the Bahamas. Mattina makes tracks! We store Mattina’s sails below deck each summer. This keeps the sun off the material and gives the sails a longer life. 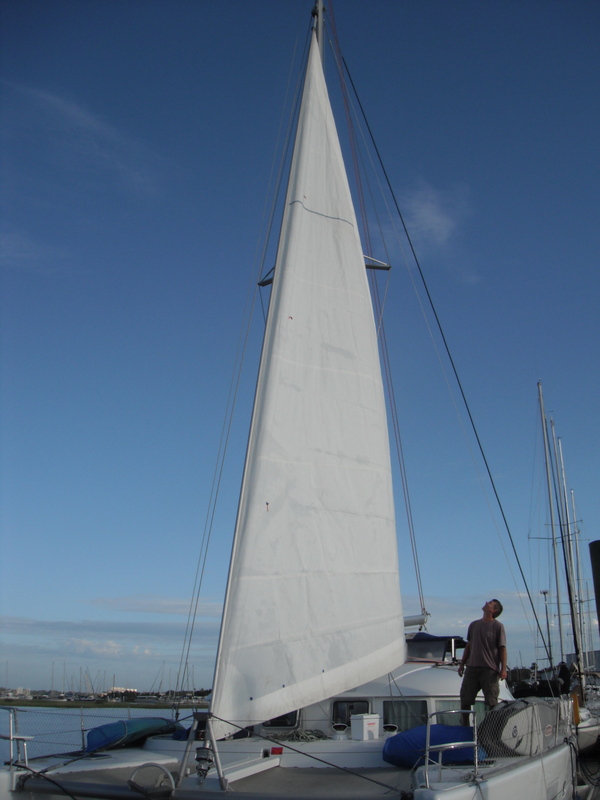 It lets us check the sails and rigging each season. The genoa is easy to rig, especially on a low wind day. 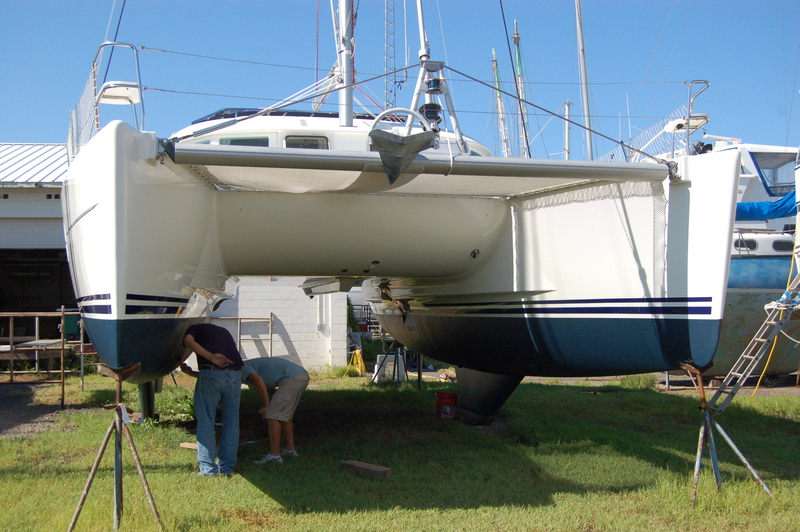 Each season we do a close inspection of Mattina’s hulls. 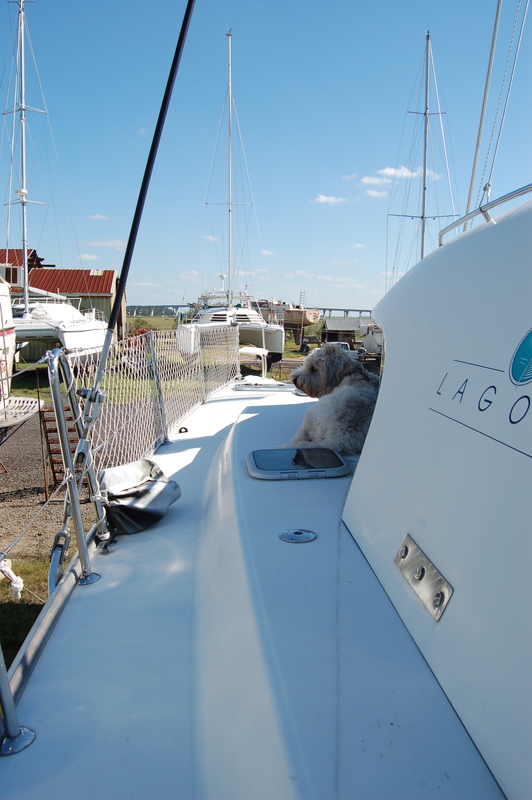 We look at every inch of the boat to make sure she is sea-ready. This keeps our boat in pristine condition. 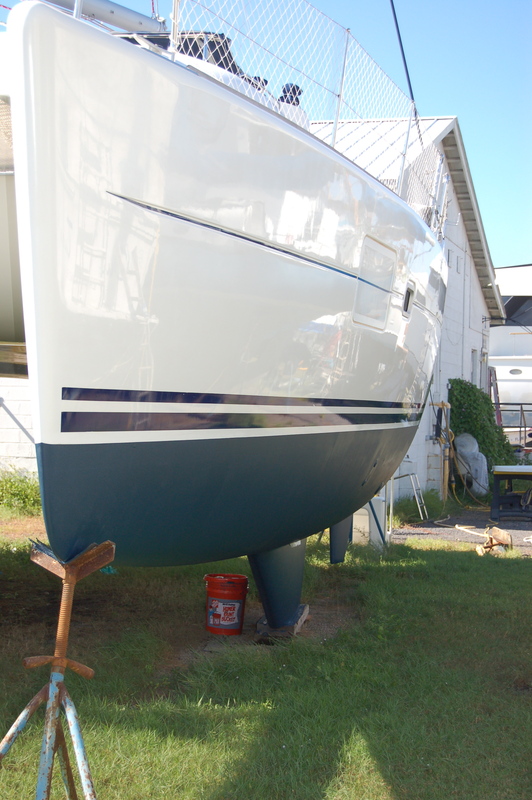 Mattina gets her hulls waxed and bottom painted. What a lovely boat! A breeze in the sails and gentle rocking of the waves must be such an inspiration for words. Kirsten, I just looked at this page and saw you had commented a while back. Thanks. Sailing and writing do go well together. Kristina, this life of yours sounds pretty idyllic, winters on a sailboat cruising, writing at sea in the calm quiet with no distractions, and touching base back in our Canada, my country. Thanks for the like on my latest post. I got quite a lot of controversial opinion on that post but I was glad to hear other writers’ opinions. Thanks so much, Kristina! Elaine, Somehow I missed your comment way back in March. I must have been traveling in the outer islands with no internet access. I’ve enjoyed reading your posts and look forward to them when I’m back on the boat this winter. Just getting a taste of fall before we go. Wow! I’m impressed you checked back that far, Kristina. Not to worry. I find if I follow the comments until I hear back I can answer anything that comes my way but not have so much of my time taken over by social media. It’s a lot sometimes. Once I hear, then I can unfollow. No disrespect to the blogger, just keeping my work to a manageable amount. I love that you shared your blissful moments of sailing and writing in words and photos. Thanks, knowing you makes me think someday my dreams will come true (finishing and getting my Dog Leader Mysteries published for kids 9 -12. And going sailing to write under big sky. I’m sure Dog Leader Mysteries will get published. You’ve got the right attitude and lots of great ideas. As for sailing, I can’t say enough positive about it. It’s a wonderful way to spend time. Great photos. OMG – Farley is sooooo cuuuute!!! Thanks. And I agree, Farley is pretty cute, but I guess I’m biased since he’s my dog. Okay, I feel like summer’s here just by traveling through your excellent pictures, Kristina. Do you spend the summers back in O Canada, our home and native land? I do. I do. Gotta get my Canadian fix in. Depending on the summer, we can be in BC, Manitoba or Ontario.